A UK company has acquired the trademark for “Bitcoin” and has allegedly threatened to bring a lawsuit against a small business that sells bitcoin-themed shirts. 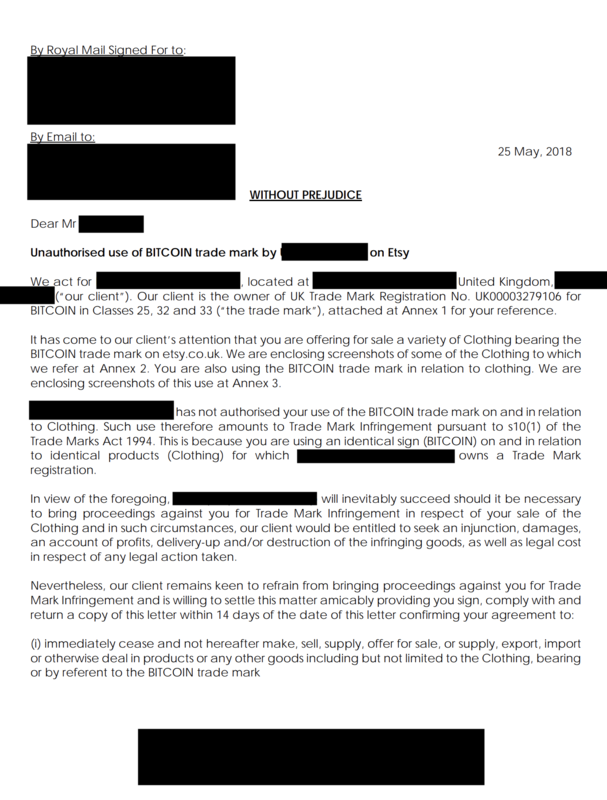 The letter, a redacted version of which the user posted online, further said that the t-shirt business must remove all bitcoin-themed merchandise from its Etsy store, recall all bitcoin-related products that have already been sold, and deliver this merchandise to the trademark owner. Failure to do so, the letter claimed, would result in a trademark infringement lawsuit. However, as the business owner soon found out, a company called A.B.C. IPHoldings South West LLC successfully obtained a trademark for “Bitcoin” last month after initially submitting the application on Dec. 27, 2017. A.B.C. IPHoldings South West LLC is listed as a subsidiary of Monolip LTD, whose mailing address appears to be a rented mailbox at a London branch of Mail Boxes Etc. The firm has only applied for one other trademark, “Westworld,” presumably due to its association with the HBO show of the same name. The application for this trademark has been published, but it has not yet been examined by the IP office. Contact information for the company was not immediately available, so CCN was unable to reach them for comment. The user who claimed to have received the letter did not immediately reply to an inquiry about how they intended to respond. It’s unclear whether the threat-sender (presumably A.B.C. IPHoldings South West or Monolip LTD) will carry out its threat, and whether the threat would hold up in court remains to be seen as well. In any case, it’s surprising that a company was able to successfully trademark the term, particularly since the flagship cryptocurrency has more or less achieved mainstream recognition over the past several years. As CCN reported, a Moscow-based company unsuccessfully attempted to obtain a Russian trademark for “Bitcoin” in 2016. Previously, the US Patent and Trademark Office rejected a California company’s attempt to obtain a “Bitcoin” trademark, though US firms can register longer trademarks that include the word.